If you have a large dog like a Great Dane, you will probably be glad to have a harness for your pet. Even the best-behaved dog can lunge at something or take off if startled. When you have a strong, muscular dog at the end of a leash, you could be thrown off your feet or dragged behind and end up injured. A harness can help give you better control of your dog and will make things relatively safer for you. While a harness can give you some measure of control over your dog, you need to keep in mind that getting the best harness for your Great Dane won’t be a panacea for all problems. The dog will still be stronger than you and will be a clear winner in any dragging contest. The best thing you can do is to teach your Great Dane from an early age to walk calmly and properly beside you, and be well-mannered in public. All dogs need to be socialized, but with a large-sized one like a Great Dane, it is even more important that they know how to behave around other people and other animals. Encourage your dog to greet newcomers in a polite way, without bounding over and leaping at them. Remember that rowdy behavior might seem tolerable in a puppy, but it can come across as downright scary from a large dog, even one that doesn’t mean to be aggressive; it may even unintentionally be the cause of accidents and injuries. Puppies will pick up your good behavior tips quite well, and so will an adult Great Dane if you are thinking of adopting one. Most Great Danes are easy-going characters and will comply with positive methods of training. There are many different reasons for getting your Great Dane a harness. 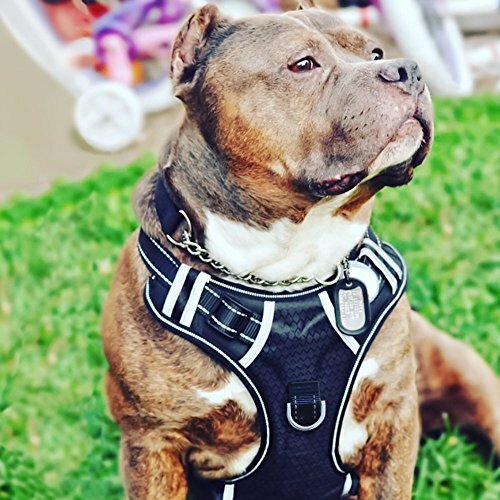 The main one, of course, is to give you better control over your dog, but pet parents may also choose a harness as it can be easier on the dog than a collar. If you pull a dog that is wearing a collar, you may injure their neck from the exerted pressure. With a harness, the pressure is distributed about the body and, as the neck is left free, there will be no risk of injuring it. Great Danes are prone to a neurological health issue known as the Wobbler Syndrome. The dog’s cervical vertebra is affected and the dog gradually loses proper control of their limbs and wobbles while walking. 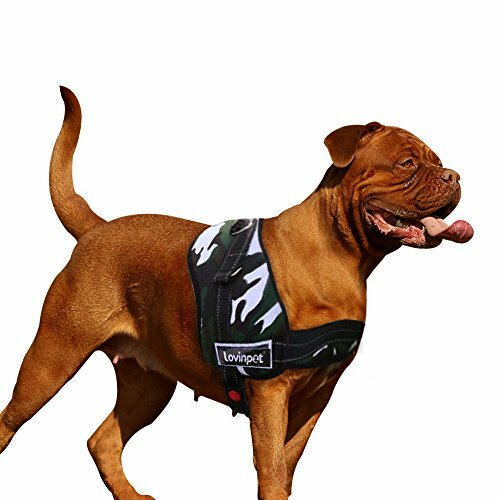 It is a painful condition that can be eased to a certain extent by medication and by using a harness instead of a collar to prevent any kind of stress on the dog’s neck. Some pet parents may also get a harness to allow their dog to join them in various recreational activities. Harnesses allow dogs to pull skis and sleds. They also give dogs an added measure of safety when you go hiking. 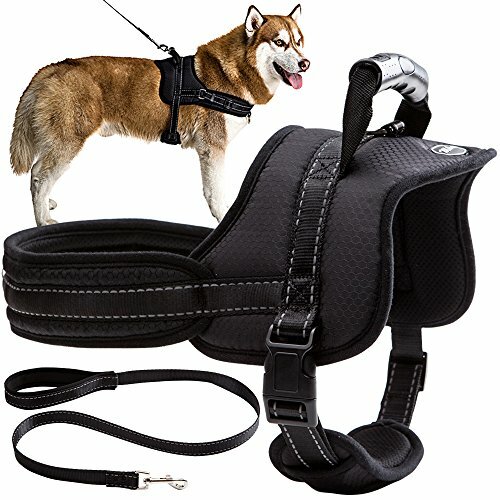 The handle on the harness will let you grab and pull your dog to safety should they slip and fall anywhere. The harness can also be attached to a car safety belt to keep your dog well-tethered when you are out driving. You don’t want your dog causing an accident because they lunged out of the car window on seeing something interesting or threatening. The harness will keep them safely inside. Great Danes have thick necks and a harness will be more comfortable and safe for them than a neck collar. 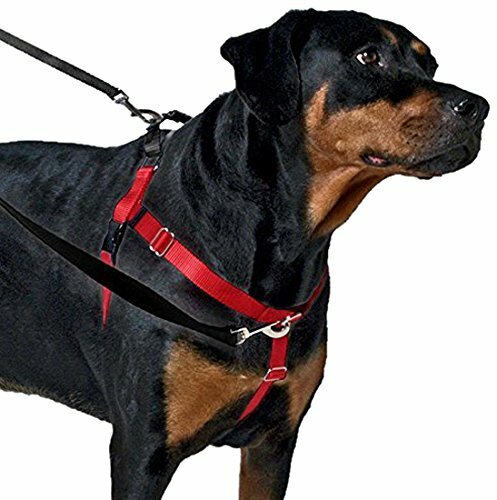 You can attach weights to some harnesses and help dogs in increasing their strength and endurance, and in recovering from injuries and medical conditions and after surgeries. Only do this under the advise of your veterinarian. The harness should be well-stitched. Given how strong Great Danes are, you don’t want the harness coming apart after repeated use. The metal or plastic parts should be strong and well-made too. The harness itself should be made of a durable, long-lasting, and all-weather material like leather or nylon. The harness should fit your Great Dane well. You don’t want it chafing your dog on their shoulders and undersides. It should have wide straps, a soft inner lining, and a padded chest and back to make it comfortable to wear for your Great Dane. 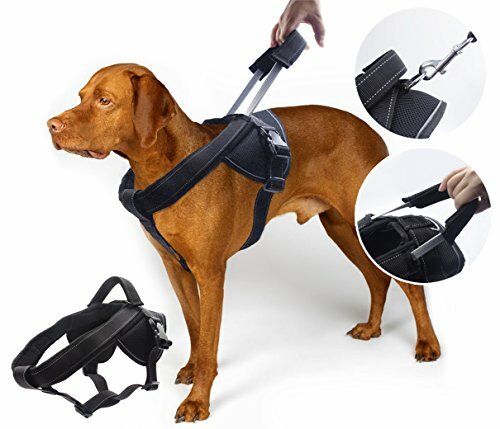 The harness should have a handle on the back to give you extra control over the dog when necessary. The chest portion of the harness should have a ring for leash attachment. This will give the harness a ‘No Pull’ feature, since, when you tug at the leash, the dog will be forced to turn toward you, instead of away. It will be easier for you to steer your Great Dane in the direction you want, instead of being dragged behind in the direction the dog wants. 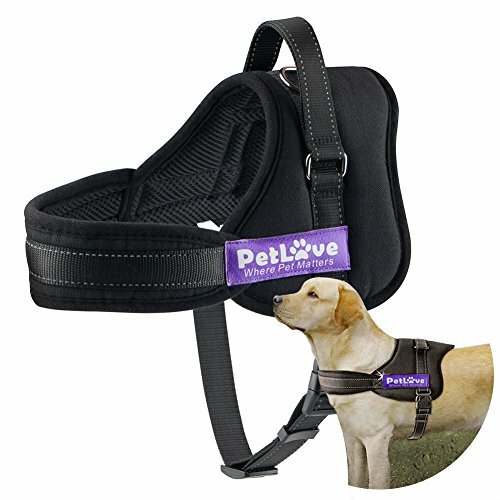 Some harnesses also have two additional rings on each side of the shoulder to give you better control over your pet. The harness should have reflective rims to increase your dog’s visibility on gloomy days and dark nights. 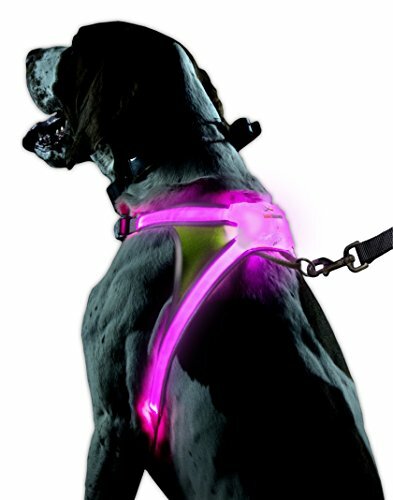 Some harnesses come equipped with rechargeable, colored LED lights in different visibility modes to make your Great Dane stand out in dark areas and keep them safe from any oncoming traffic. The harness should be adjustable to fit your dog well. This is a good feature to have if your Great Dane is still in their growing stages. It will save you from having to buy a new harness every few months. It should be easy to put on and remove. Some dogs dislike having to step into a harness. It is better to have a harness that you can slip over your dog’s head and then buckle at the back. Is the harness strongly built and made of durable materials? You don’t want a harness that will tear and come apart with the first lunge that your Great Dane makes. Should you get a leather or a nylon harness? If you plan on getting your Great Dane involved in any water activities, a nylon harness may be better. Is the harness a snug fit for your Great Dane? You don’t want it slipping off or slipping out of correct position. At the same time, it shouldn’t tight enough to chafe your dog’s skin or make it difficult for them to breath. Is the harness adjustable for your growing Great Dane puppy? Great Dane puppies seem to shoot up overnight and buying a new harness for every growth spurt may not be practicable. It is much more convenient if you have a harness that you can adjust to fit your growing dog. 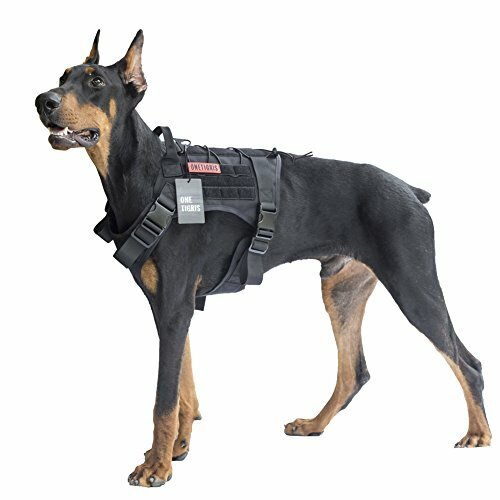 Is the harness padded to make it comfortable to wear for your Great Dane? Is the harness light-weight? You dog may be made uncomfortable or they may get irritated if the harness is heavy to wear. Is the harness aesthetically pleasing? You can get harnesses in different designs, with different colors and decorations. From metal spikes and studs as decorations to teddy bears and butterflies, you can get the type of harness you want. Is the harness washable and easy to clean? Is the price of the harness right for your budget? Some harnesses may be expensive, but you might want to take the long-term view and pick one that is durable and will last your dog a long time. If you have a Great Dane puppy, it is better to train it to walk beside you with a flat collar and a leash. 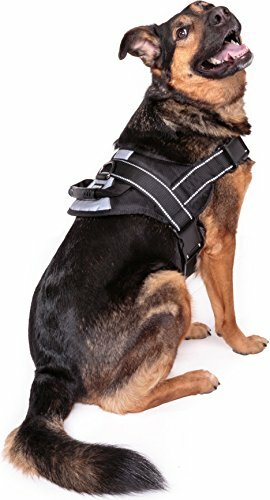 You can move to a harness after the dog knows how to walk well with you, and responds to voice commands and hand signals. Just like with a collar, your Great Dane may need some time to get used to wearing a harness. The feel of the harness may annoy some dogs and they may roll about in an effort to get rid of it. Put it on for short periods and extend the duration gradually as your dog gets accustomed to it. Ideally, your dog should not even notice that they have the harness on. Harnesses are better for Great Danes than collars, both from the point of handling the dog and the dog’s health. Pulling at a collar can put pressure on the dog’s throat and larynx and possibly cause an injury. 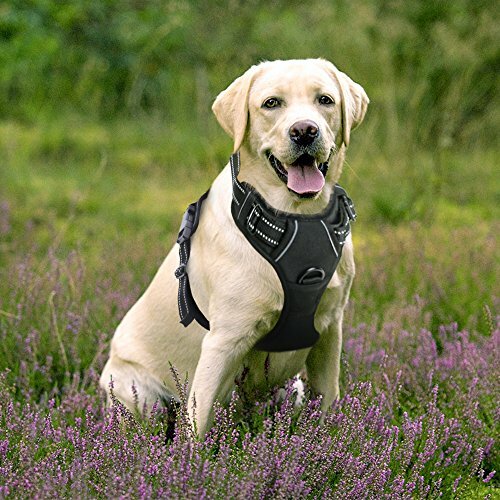 With a harness, the pressure is distributed throughout the body and, as long as the harness fits your dog well, there is less chance of an injury. 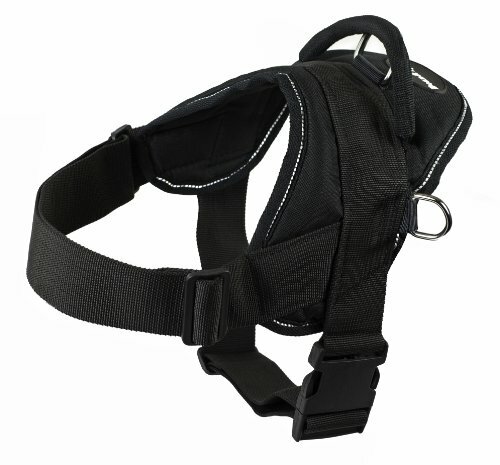 Look for a good quality harness made from durable materials that will last, and fit your Great Dane well. While price is an important consideration when buying anything, try as much as possible to go for a quality harness as it will last longer and keep your dog safer.